A zombie drama (drombie? zomba?) has emerge from across the pond. It’s called In the Flesh (http://www.bbc.co.uk/programmes/p00szzcm) and it premiered on Sunday on the BBC Three network. 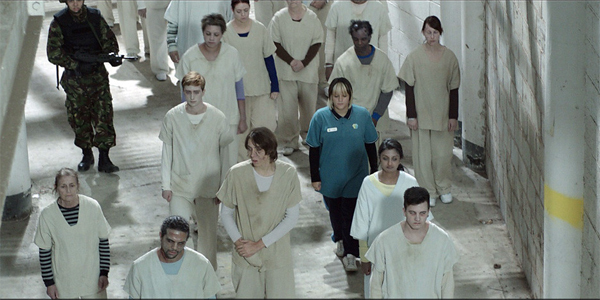 The show is set after a zombie uprising, and picks up with "treated" zombies "rehabilitated back into society." The lead character’s name is Kieren Walker (Luke Newberry), yes WALKER, and he’s a zombie who, after turning, ends up in a zombie rehab facility where he takes medication, exercises, and deals with the angst that goes along with being a zombie. You know, like killing people. He’s prepping to return home and is a tad anxious about this. It seems that these zombies have maintained a bit of their conscience, just like Milton from The Walking Dead suspected. Kieren struggles greatly with his new affliction and seems to appreciate life more now as a zombie than when he was a live human. The program airs Sundays at 10 p.m. on BBC Three, but the first episode is currently viewable online for citizens on the American side of the pond. But before you watch, check out the couple vid clips we've embedded below for your enjoyment.